Using the race computer integral within the Sailmon MM104 Instrument, this stand alone Sailmon system was supplied and installed to Themis's owner by yachtSOFT Marine Electronics of NY & Connecticut, one of Sailmon's Authorised Dealer's in the US. 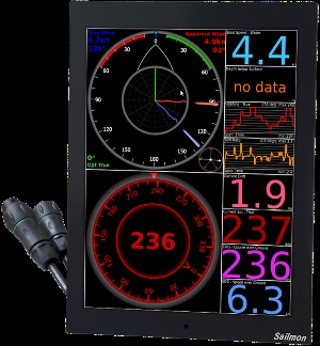 Comprising NMEA 2000 speed/depth, wind, GPS, compass and heading sensors, all the raw data is put on the NMEA 2000 bus which is connected to the NMEA 2000 port on the Sailmon S-Box. 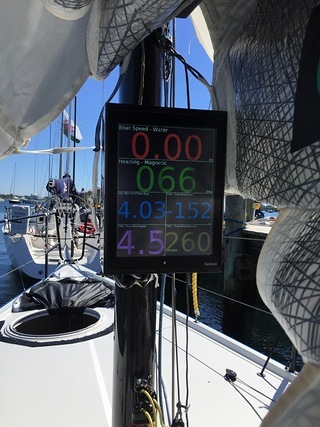 The data is sent to the Sailmon MM104 mast mounted Instrument where the numbers are processed and then displayed on the user configurable, bright sunlight display. Just before the BIRW (Block Island Race Week) in June, Geoff Ewenson, the pro navigator on board quoted "Excellent day today. First real day using the Instruments as they are meant to be used. Actually took time out of our pre-race routine to work on proper calibration, both upwind and reaching. The very intuitive user interface coupled with a very succinct operating manual made for a very simple calibration for the day! So far we are very happy we chose Sailmon! The displays are amazing and very easy to read"
Other features of this installation included an interface with Expedition, the world renowned tactical and navigation software provider. Close co-operation between Sailmon and Expedition enables Expedition values can be selected if required and displayed at the mast on the MM104 instrument.